This Upgrade is for registered owners of SampleTank 3, AmpliTube 4, Miroslav Philharmonik 2, and T-RackS Grand Only. Once you're verified as a registered owner, you'll recieve the eLicense. "Your very own fully stocked recording studio"
Everything you could ever need for recording, sound design, mixing and mastering on your computer and more — that's Total Studio MAX. 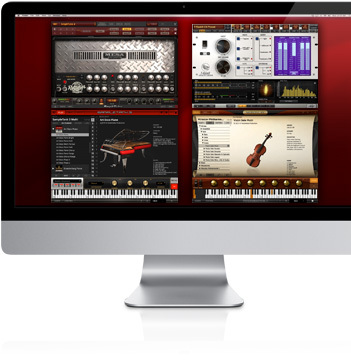 An exciting bundle for the discerning producer who truly wants it all, it collects all three of the comprehensive MAX bundles, AmpliTube® MAX, SampleTank® MAX and T-RackS® MAX bundles, plus adds in Miroslav Philharmonik 2 to create the ultimate IK Multimedia bundle for studio use. 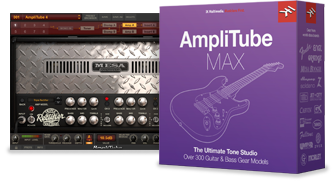 Create your ultimate guitar or bass dream rig with AmpliTube MAX's massive collection of over 300 pieces of guitar and bass gear, including gear from the world's top manufacturers. Mix, master and add that perfect professional finishing touch with T-RackS MAX's 33 high-end processors modeled on some of the most popular hardware modules ever made. Explore a new universe of sound with SampleTank MAX and Miroslav Philharmonik 2, which provide a massive library of over 110GBs worth of samples with over 7,300 instruments. And you can do all of this for one extremely low price that's a full 89% off what it would cost you to buy everything individually. Jaw dropping tone, amazing sonic flexibility and serious realism are all what Amplitube MAX is about. Included in Total Studio MAX, it gives you all the things you need to make the guitar or bass rig of your dreams. It comes with AmpliTube 4 Deluxe, Fender® Collection, AmpliTube MESA/Boogie®, AmpliTube Orange®, Ampeg® SVX, AmpliTube Jimi Hendrix™ Anniversary Edition, AmpliTube Slash, AmpliTube Metal and a whole lot more. In total, you get over 300 amplifiers, cabinets, stomp boxes, rack effects and mics modeled after some of the most sought after gear on the planet. Want to mix and master like a pro? 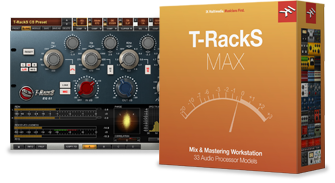 Total Studio MAX comes with T-RackS MAX, the ultimate version of our mixing and mastering suite. You get all the included processors in T-RackS Grand plus all the individual pieces available in the T-RackS Custom Shop. You get 33 modules that cover everything from contemporary classics like our multiband Quad compressor series and near-invisible Stealth Limiter to timeless favorites like the Vintage Tube Compressor and EQ P50 series. Each one has been modeled after some of the most desirable studio hardware of all time. Take control of your very own sonic universe with the creative power of SampleTank MAX and Miroslav Philharmonik 2, both included in Total Studio MAX. Between the two, you can explore a massive sound library with over 110GBs and over 7,300 instruments. 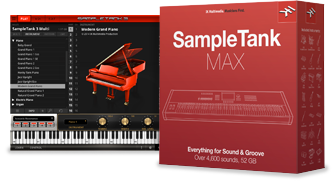 SampleTank MAX gives you all the power of IK's cutting-edge SampleTank 3 sound and groove workstation plus 22 additional instrument collections from the SampleTank Custom Shop. These include Art Deco Piano, Cinematic Percussion, Hugh Padgham Drums, American Acoustic, Elektronika series, the Beats series and more. Miroslav Philharmonik 2, also included in the Total Studio MAX bundle, puts the most emotionally expressive orchestral collection ever released at your fingertips. You can manipulate all your sounds and record with SampleTank 3's 55 high-quality effects, advanced synth section and 16-channel DAW-style mixer. All the included bundles and software can be used either on their own or as plug-ins in your DAW of choice. With the Total Studio MAX, you’ll have absolutely every possible sound available to you, and ones you’ve never dreamed… yet. Maximize your Studio with Total Studio MAX. Minimal: Intel® Core™ 2 Duo, 2 GB of RAM, Mac OS X 10.7 or later. 120 GB of hard drive space. Windows® 8 or Windows® 10. 120 GB of hard drive space. Requires an ASIO compatible sound card.